Not only that but during the Holidays we tend to have people over to the house a lot. 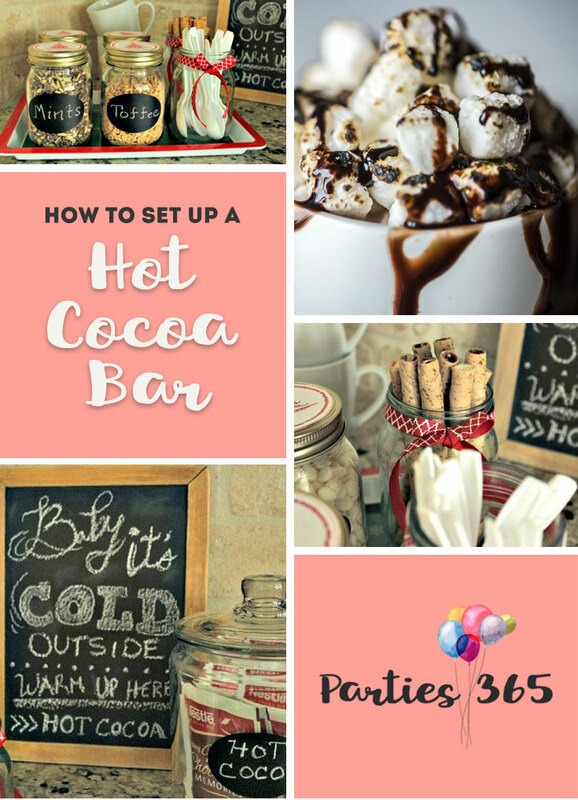 By having this hot cocoa bar already put together, it makes one less thing I have to prep. The guests know it’s there and they help themselves. I purchased the mason jars at Walmart, but you can find similar ones on Amazon right here. I like how they are plain and have no design on them. It makes them easy to apply labels to and I think they just look classy. To dress up the mason jars, I added printable labels I found a while ago on A Sonoma Garden. 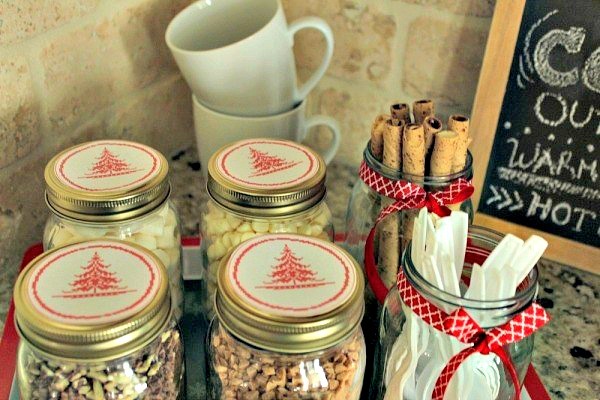 They were on her sidebar with a link to the labels, but in case they’re gone, you might also like these Christmas Tree mason jar labels (which would be perfect for neighbor gifts as well). I also added some red ribbon I purchased at Hobby Lobby. 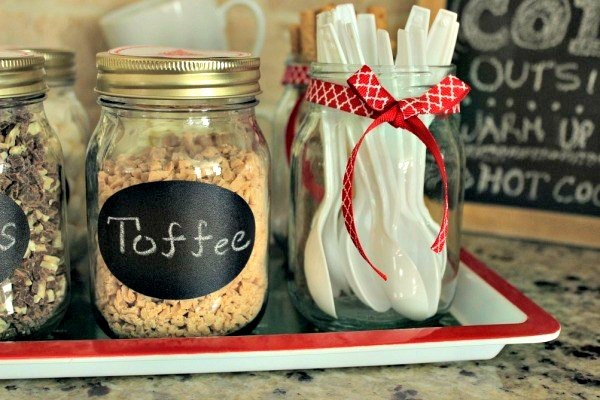 In order to know what’s in the mason jars, I purchased vinyl chalkboard labels from Hobby Lobby (these chalkboard labels even come with a chalk marker). I am really pleased with these because not only are they easy to reapply, but the chalk comes off easily. Speaking of chalkboards…I kind of have a thing for them. I have one hanging in the dining room for our weekly menu and grocery list needs. I found a chalkboard design on Etsy that I loved and had my artsy son recreate it on a chalkboard I bought at…you guessed it, Hobby Lobby. I really think it adds to the area and it’s something new for this year. To store the hot cocoa, I used a glass container I purchased at Target (I found a similar glass jar on Amazon as well). I have several of these glass containers and I love them so much. I’ve used them for parties, pantry storage and have even let friends borrow them for their parties. I need a few more I think and they’re a great price! 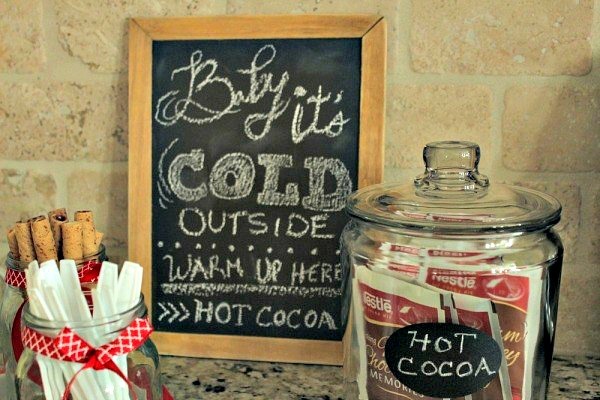 I added a chalkboard label to the Hot Cocoa jar because it just looks cute. Put whatever you like! I have marshmallows, white chocolate chips, crushed Andes mints and crushed Heath toppings. I absolutely love these Pepperidge Farm Crème Filled Pirouette Rolled Wafers. 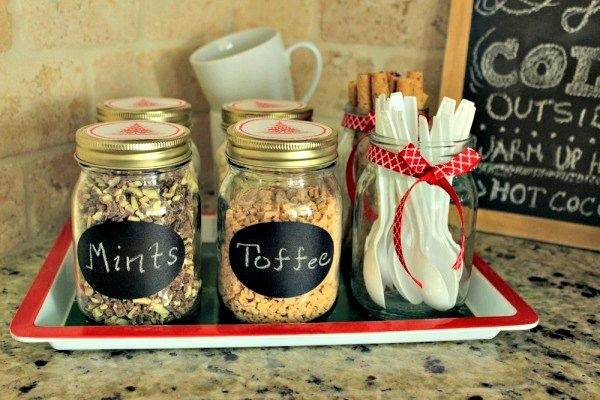 They go great with hot cocoa or coffee and I set them out when guests are coming over. (And when the kids ask for them of course!) I purchased them in flavors French Vanilla and Chocolate Hazelnut. Last but not least, be sure to have spoons for stirring. Mugs for drinking in. And a pretty tray to set it all on. Now you’re ready to enjoy Hot Cocoa at any minute of the day or night with ease. 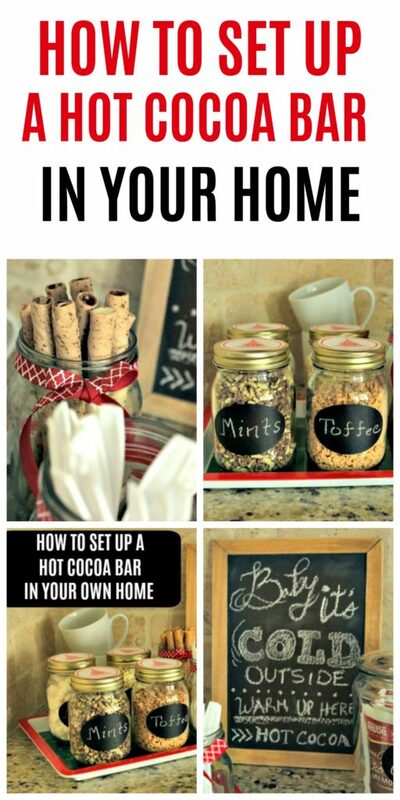 Your guests will also love your set up and you’ll help them to feel right at home. Do you set up some sort of hot drink station during the cold months? 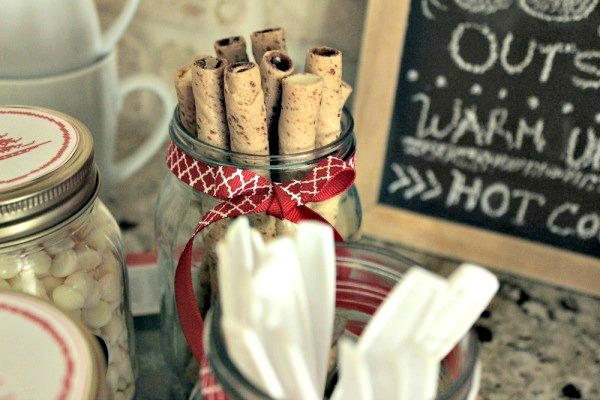 We look forward to our hot cocoa bar every year. Love your set up! We set one up last year on my hoosier cabinet and loved it!! Thanks for sharing with SYC. Forgot to mention, I’m sure it’s not intentional, but I’m not seeing a link back to the party.